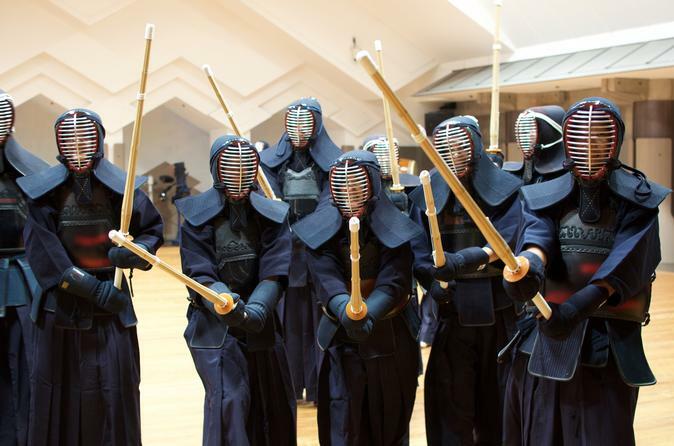 The Kendo experience is about swordsmanship, a traditional Japanese martial arts skill of the samurai, the path of the sword in Japan. This experience allows you to work with a kendo instructor who speaks English and Japanese in a way that is simple and easy to understand. Even beginners will be able to participate in an actual fight. This 2-hour experience will begin and end at JR Uguisudani Station North Exit. You won't leave this tour empty handed, head home with one drink and a kendo towel. Meet your experienced kendo instructor at JR Uguisudani Station North Gate. The start time is flexible. You will choose your preferred time when booking. This tour is one of the few martial arts experiences that involves actual fighting, even for beginners. Discover a dojo of tranquility, etiquette and bamboo sword strikes. Samurai training will hone the mind and body. An experienced teacher will guide you through this 2-hour safe and fun experience. This genuine Samurai experience mainly takes place in Tokyo's 23 wards. This tour will end at JR Uguisudani station North exit after approximately 2-hours of fun samurai fighting.